Medical technology, often called medtech, has the highest density ratio per inhabitant of companies in the sector1, with some 3,700 companies employing 51,000 people in the whole of Switzerland. On average, over the last ten years medtech has contributed 2% to Swiss GDP and 5.5% total export value, while 13% total revenue in the field was invested in R&D. For example, the world’s first cardiac stent was developed in Switzerland. In 2011, Switzerland ranked third in the Europe in terms of absolute numbers of medtech pat ent filings2. IN 2011, SWITZERLAND RANKED THIRD IN THE EUROPE IN TERMS OF ABSOLUTE NUMBERS OF MEDTECH PATENT FILINGS. The BioAlps cluster gathers together the com petences and know-how of many leading aca demic institutions; these initiate many med tech research projects with the industry. There are numerous world class medtech companies in the field of implants, hearing aids, lab instru ments and non invasive surgical systems in the country. About 10% of the medtech compa nies based in Switzerland are located in the BioAlps cluster, close to leading academic insti tutions. More specifically, multinationals such as Medtronic, Edwards Lifesciences, Beckman Coulter, Agilent, Biosensors Europe and Johnson & Johnson have settled their research, development, production, sales and market ing operations within the BioAlps cluster. A multitude of start-ups are active in fields as varied as cardiovascular health, orthopaedics, oral care, ophthalmology, neurology, meta bolic diseases and intensive care. They benefit from the proximity to research projects such as the translational programme on Neuroscience and Neuroengineering at the Ecole Poly technique Fédérale de Lausanne (EPFL), jointly run with Harvard University. The Inselspital in Berne, Lausanne University Hospital (CHUV) and the Geneva University Hospitals (HUG) regularly set up clinical studies with medical technology partners, with teams dedicated to both research and training. In the medtech sector, the Western Switzer land region builds on its traditional microtechnology skills to create new products. Such companies as Valtronic or De Puy Groups are situated in traditional watchmaking areas to be able to leverage this very particular expertise. Furthermore, the National Centre of Compe tence in Research (NCCR) Robotics3, launched by the Swiss National Science Foundation, is a nation-wide center with the common objec tive of developing new human-oriented ro botic technology for improving our quality of life, has chosen EPFL as the home institution. Winner of the 2012 PriceWaterhouseCooper “Coup de Coeur” award and 2010 R&D magazine USA’s Award for being one of the top 100 most technologically significant products on the market, Sensimed is revolutionizing glaucoma management with its lens to monitor fluctuations of intraocular pressure in glaucoma treatment, the Sensimed Triggerfish® system. Based on research carried out in the EPFL in Lausanne, Sensimed is a spin-off of the institution. The project was initiated after a meeting between ophthalmologists and researchers Matteo Leonardi and Sacha Cerboni. Sensimed Triggerfish® is currently in restricted commercialization in various countries. 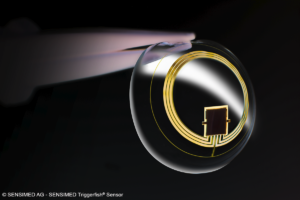 Sensimed has also set up a collaboration with Nidek in Japan to develop the registration path for Sensimed Triggerfish® in Japan and has obtained a CPT-III code in the USA, and is currently in the clearing process with the FDA. Since its creation, the company has successfully raised more than CHF 53 million from venture capitalists within the cluster and abroad. Medtech prospers at the intersection of research, technology and medical need to create innovative products for world markets. Western Switzerland offers a close-knit network of research institutions, teaching and research hospitals, and technology centres, enabling cutting edge research to take place. The lists below are non exhaustive and showcase some examples of the work being done in the region. Cardiac devices such as heart valves, stents, biodegradable mitral ring, hydrogel product to prevent epipericardiac adherences. Product concepts such as artificial retinas and hearing aids.